Sight reading music has everyone curious about how it's done (photo). This skill is very much akin to rapid reading (sometimes called "speed reading"). All good sight readers read things differently than students are taught to read in school; many of those sight readers are not aware they're doing something differently; they just do it. The difference is in their eye movements. Their eyes make fewer stops, and they see more than one symbol on the page at a time; they look at the page the same way they would look at a photograph or drawing; the eyes sweep all over the page. Which, upon a little thought, seems perfectly natural; no one can imagine looking at a photograph of a brick wall by taking a look at each brick, left to right, starting at the top and their working down, brick by brick; our eyes instead are using all of their seeing ability and moving around, taking it all in. They don't just look at one point and move their eyes from detail to detail the way most people were taught to read, i.e. by saying each word out loud to themselves, pretending they don't see more than one word at a time; instead they do it differently by using all of their seeing ability. It's all a matter of eye training; expanding our eye's field of vision like this allows the mind to take in more information from the page at a glance. The eyes do not see in a line; they see in a circle, and they can see pretty clearly something the size of about a half dollar; it's in fact impossible, when reading, to see more than one word at a time. It's not as hard as people might think, to learn how to comprehend groups of words or symbols at a time (although it does take practice). All of this can be endlessly fascinating. It will help to get a copy of Peter Kump's "Breakthrough Rapid Reading" and go through it carefully and thoroughly, working the exercises in each chapter before moving on to the next one. The entire book can be gone through in a matter of just a few weeks, and it's time well invested. Once you begin reading faster with these exercises, they're not hard to adapt to music reading. The eyes, when reading music, should always be kept moving right with no backtracking, and this may be practiced away from the console by tracing a line with the index finger across the score; here the eyes should just follow the finger without actually reading the notes. This is to develop the sweep of the eyes. Then, using the same type of finger tracing, we can take just one measure of music and practice tracing a series of "W" wiggles from the top of the top staff to the bottom of the bottom staff to get the eyes used to tracing from top to bottom. After this, we can combine the two motions -- up and down "W's" moving forward and to the right, which trains the eye to focus on taking in more information in the periphery of its vision. These eye movements may then be taken to the keys and given a try, the first goal of which is to navigate the keyboards with "blind touch" so we don't take our eyes off the score by looking at our hands or feet. Taking our eyes off the score causes an interruption in the flow of visual information which can easily and often does lead to a breakdown in fluency. We can make great strides by simply learning to take in all the eyes can see, keeping our hands and feet in contact with the keys as much as possible and our eyes glued to the page, letting go of conscious control of the body, relaxing into it, and trusting the positions of the manual and pedal keys which are already fixed in our kinesthetic memory to lead the body to respond effortlessly to the visual images on the page. 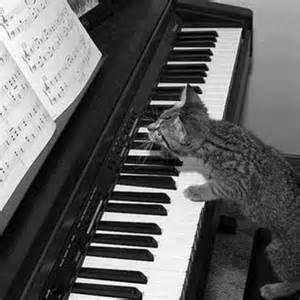 Again, it takes no musical talent whatsoever to learn to sight read music; it's a skill just like typing. You see symbols, you press keys. It's just a matter of learning to read groups of musical symbols as if they were groups of words and getting comfortable with "blind touch," both of which can be developed with a modicum of practice.